In updating our post today it is very apparent that the AcuRite 01301 Pro 3-in-1 color station that this review is written for isn’t available any more at this time. It has been updated to the AcuRite 00622 model, which is available for purchase now. The new AcuRite appears to be doing very well in sales on Amazon. It is highly rated and picks up where the older model left off. Customers are still raving about the awesome colored screen on the display, and they also still like the ease with which the unit is set up. The same annoyance is still there the screen is reportedly still difficult to read from a distance especially reading it from an angle is very difficult. Take a closer look at the AcuRite 00622 Pro by going to the sales page to examine it closer. You will see that it is close to the same unit we have reviewed here but with a newer model number. As a big fan of the four seasons we experience annually, I am also a fan of watching things daily on a very up close scale. To do this properly you will need some measuring tools, to keep track of things for you. I was doing some more searching for station choices, that’s how this review came about, here’s what I found. 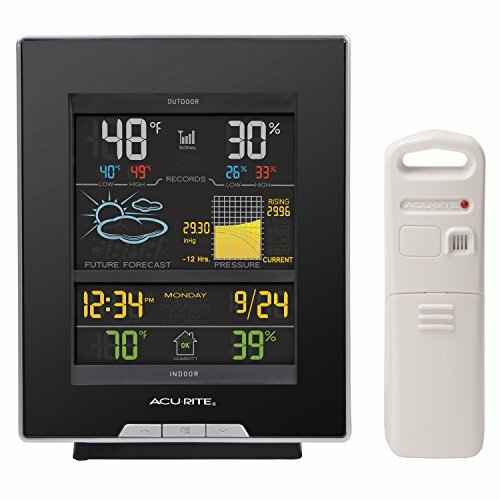 The AcuRite 01301 Pro Color Weather Station is exciting and easy to use. It provides temperature changes, and relative humidity changes as well as measures and records the wind speed in your area. So you have the basic tools at your disposal to start tracking daily any outdoor changes in weather you will be living with. It will become a fun trip, and also an educational one. This model from AcuRite is the perfect collector of data for the beginner, or the amateur weather watcher. If you just need something for you to look at quickly, and have a very general idea of what it is like outside today, than this will provide the necessary information for you. You can organize your outings better using the 01301 Pro. You will be prepared for that afternoon down pour from now on. You shouldn’t have to experience very many big weather surprises any more. This model houses temperature, and relative humidity sensors. It also has included with it a wind speed anemometer. The sensor can be installed in the outside location of your choice. Your choice for placement, should be to maximize the sensors accuracy and transmission. The AcuRite sensors are sensitive to surrounding environmental conditions. The best way to place your 3-in-1 sensor is to find a place not directly in the sunlight, yet a place that is in the open enough to pick up the wind blowing in your location. The trick is to realize that the instrument sensors are very sensitive to direct sunlight as well as the anemometer will not do it’s job if you are in a sheltered area. Keep that in mind as you progress with your placement. As we continue this review of the AcuRite 01301, another important bit of information is to be aware, there isn’t much space between the mounting hole (to fasten the sensor down) and your sensors. Your mission is to find a piece of PVC pipe (3/4” schedule 40 PVC) where you can set the mounting piece onto the PVC pipe so that you may secure the sensor in the location you have picked out. This is one suggestion. Another would be to locate onto the top of a fence post, or mount onto the outside corner of a tool shed, or a corner of your house. These are a couple of suggestions. This could be a tricky thing, but if planned out properly, you will be able to handle properly. Please make sure there aren’t any things in the way. Find as open a location as possible. Some things to remember are, the sensor must be within 330 feet (100 m) of display companion unit. Please try to place sensor away from large metallic items, thick walls, metal surfaces, or other objects that may limit wireless communication. Also realize that the sensor is best served away from heaters, air conditioners, chimneys, exhaust vents, as well as asphalt and concrete surfaces. Beware of surfaces that radiate heat, this would affect your sensors. Avoid installing the sensor near pools, spas, or other bodies of water. Water sources may impact humidity accuracy. Also it would be a good idea to make sure you are located away from any sprinkler systems. Forced water wouldn’t be a good idea either. Locate the sensor in an open area, preferably above the ground a bit, so that you are insuring as accurate as possible wind speed calculations. Please be aware that the wind cups on top of the sensor, need to be free to spin. They are how the wind speed is being measured. This is the reason the cups need to spin in a 360 degree fashion to properly measure the wind speed. The sensor is recommended to be installed either on a pole mounting where it is suggested that you would use a 3/4” schedule 40 PVC, (this is not included), a side mount, or on a top mount.The sensor also has an A-B-C switch. The A-B-C is located inside the battery compartment, midway down from the top on the sensor. It can be set to A, B or C. But you must be aware that you must select the same letter choices for both the sensor and the display unit it is being paired with. This is a must in order for the units to synchronize (communicate properly together). In looking at the sensors you need to know how accurate and sensitive these sensors are. The manufacturer has rated the instruments to have a range for fluctuation of the accuracy. Humidity range that the humidity sensor will accurately work for is relative humidity of 1% to a relative humidity reading as high as 99% humid. Wow that is really humid. The humidity accuracy error ranges, change in intervals as the relative humidity increases. It appears the error rate is higher at lower humidity levels and the highest levels. It appears the ranges that are more normal from 20-80% humid is where the sensor is most accurate. This is a good thing. Wireless-there aren’t any wires or cords needed to transmit the information from the remote sensor to the display. Top distance for transmitting well is 330 feet(100 meters)depending on home construction materials you will be transmitting through. This is the heart and soul of the AcuRite 01301 Pro. Follow us through our views of this area, and everything that is part of this display unit. Let’s take an in depth look at the colored display of the 01301 Pro. When you look at the display screen, it appears as two halves, the top level layer, and the bottom level layer. The top level half has the outdoor temperature displayed on the upper level corner. In this level you also have the outdoor relative humidity displayed. Then in the center of the top level layer you have the current wind speed displayed. Here you also will find the average wind speed of the last 30 minutes, as well as the last 30 minutes’ highest wind speed. Most prominent in this area is the wind gust icon. This will show the wind speed for the current wind gusts. Next up is the right hand corner of the top level layer. This is the home of the current indoor temperature, as well as the current relative humidity of the inside of your home. On the lower left hand of the bottom level layer is the wind chill displayed. The weather select button is also here. This area displays the following various measurements and readings: Displays heat index, dew point or wind chill, daily, monthly, all time high & low records indoor/outdoor temperatures and humidity and high for wind speed. The center of the lower level layer is the weather forecasting area. Then in the center of the bottom level half is probably my favorite area. This area is the weather prediction area. The learning mode will show for the first 14 to 21 days as the forecast calculating algorithm is learning to forecast your weather for your location. Also displayed here is the current barometric pressure outside. The 12 to 24 Hour Weather Forecast Self-Calibrating Forecasting sensor pulls data from the outdoor sensor to generate your personal forecast. The following icons are used to show the forecast for your location for the next 12-24 hours. The lower right hand level layer shows you the history chart for your location. pressure, temperature and humidity. Pretty interesting stuff to a weather buff. The last thing is the very center of the display. This is the home of today’s calendar date as well as the current time, display either in am or pm 12 hour mode. You will need to remember this calendar and clock are not kept accurate by the atomic clock transmission. They are not connected to the atomic clock, so you will need to keep a close eye on this, to insure accuracy. The Replay and Live data buttons are also housed in this center area of the display. This weather station stores historical data that can be viewed in Replay Mode. The data is recorded for the past 48 hours in 30 minute intervals. The data is collected on the hour and half hour. This data when shown is also stamped with time and date of the collection for your records. To bring this up press the “REPLAY” button to enter Replay Mode. To manually exit Replay Mode at any time, press the “REPLAY” button. The display may show or flash the “LIVE” icon to confirm you are exiting the replay mode. seconds by pressing the button. But when the display is powered with the power adapter, the backlight remains on(at 100% brightness). But you can then dim down to 60% and 30% dimmer by press the “” again, then again to dim. Please note that something the dimmer will do, is that it will dim according to the time of day, and time of year. It does this automatically. Here is the dimmer time schedule for you. Another thing to be aware of is that the backlight (when using AC Power adapter) is very bright and can be a real distraction to you at night time. Even on the maximized dimmer setting, the backlight can still be too bright for some people. Please be aware of this if you are very sensitive to bright lights at night. The display unit is powered by 6 “AA” batteries. The AcuRite 01301 Pro is a highly rated weather station. After examining this selection we would give it a 4.1 star rating. This rating of ours is based on it being purchased by a casual weather observer. The thermometers and the relative humidity sensor are accurate enough to provide a reliable back drop of temperature and humidity to live your daily life around. However if you are serious about the goings on outside, then you will want to skip over this product. We found that there is some good evidence to suggest that the wind speed isn’t always calculated accurately. Most weather displays of this type have the regular instruments, but many do not venture into anemometers. That seems to be the dividing line from hobby/casual observer to serious weather geek, data collector type of people. The more serious person would not be happy with the anemometer provided on the outside remote sensor pack. So as ratings go, the ratings are generally correct for the type of purchasers that are buying this station from AcuRite. If I am a person who wants general temperature and a weather forecast to be there as a guide for me, then I would rate this in the range that hundreds of buyers have. Please match up the seriousness in the person’s love for the weather, with the display unit/station you are looking to purchase. The last point that I would like to offer is that the temperature and relative humidity sensors appear to be very reliable, and very accurate. This should weigh in well with your decision to purchase or not. Dependable instruments are important. We found that in many places the display unit appears to be sold separately from the needed remote sensor unit. 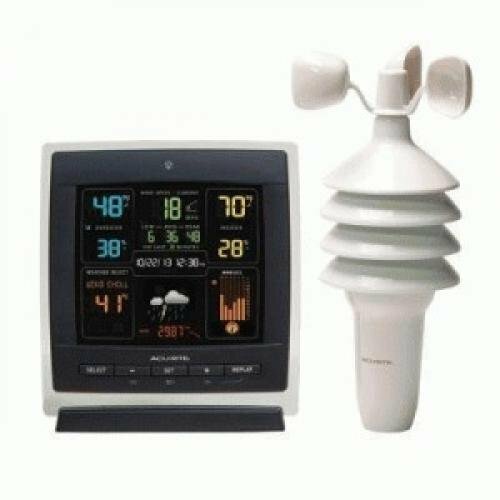 In this recommended weather station you will find the display unit as described, along with the AC power adapter, and the outside sensor unit to be all included in one, great, lower price. We like the three pieces being together as a station. The price is very much in line with competitive weather stations from other manufacturers. One needs to just look at the eye appeal of this AcuRite model to be sold on the colorful display and it’s multiple offerings of local outside world instrument readings, and data that is collected throughout the day for you. A very good price, for an amateur entry into the weather station world. We believe money well spent for a nice gift for someone who like to do things outside. It will help them to better plan for outings, such as boating, fishing, golfing, picnics, gardening, short road trips, etc. It appears that to purchase a new sensor or a new power cord, is easy and cost effective. This is in case of long term use, one of these parts would not be in working order any longer. In examining the price options it is offered for $20.00 more to buy the display with icons. Without the icons (Just Text) is offered at $20.00 less. If you are looking at other AcuRite Models, this unit compares very favorably with the price on units that do not have an anemometer, but they do have a barometric readings area instead. It appears to be less information and less cost for the Barometric pressure without the wind speed anemometer. The wind speed costs more to have, and you will be getting more information as well, but then you will be getting less information on the display. An example of the barometric pressure, no anemometers, and less information is this model, AcuRite 02008A1 Color Weather Station with Forecast. The AcuRite 01036 Pro Weather Station is a standard in the complete line of AcuRite professional weather instrument gathering stations. This review article is a look at the AcuRite 01512 Pro Color Weather Station. Get the outdoor environmental information you want right in your own backyard with AcuRite's Pro Color Weather Station. Its high-precision 3-in-1 weather sensor accurately measures three different conditions, including the temperature, humidity and wind speed, giving you easy-to-understand, comprehensive data about the elements surrounding your home. The 3-in-1 sensor is easy to setup, includes mounting hardware, and features a 2 year battery life for maintenance-free operation. Stay informed of the changing conditions outside your home environment with AcuRite's Pro Color Weather Station. The AcuRite 01301 Pro was recently replaced by the Acurtite 00622 Pro Color Weather Station. The review is written for the 01301 model and this update is the same model with a couple of new updates.